Playing Lean is available as an additional module to our Business and Strategy Development Training Course. Playing Lean Simulates a Lean Business Startup. It’s a board game where players are forced to make difficult business decisions without real world risks. In Playing Lean, you lead a team that tries to get from an idea to a winning product. The transition from dealing with visionary individuals to capturing large chunks of thousands of customers will be difficult. The choices you make will be hard ones: should you go with your gut instinct and build what you think the market needs, or should you spend your resources on experiments to learn about potential customers? 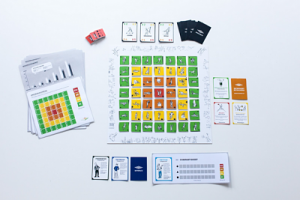 Playing Lean simulates the experience of launching a successful product into a board game that can be played in 90 minutes although with rich discussion the reality is probably 180 minutes.